This was scheduled to post a couple weeks ago and I saved it but forget to hit publish. So enjoy!! I have been working on watercolor and different techniques lately, so today I am post the Tissue Paper Embossing Technique or some call it Faux Silk Technique. We did this technique at one of our Stampin' Palooza's. Click here to see that post. Click here to see the detailed instructions on how to do this technique. I did this one a little different, I stamped on the tissue paper, instead of dragging in through a watercolor wash. 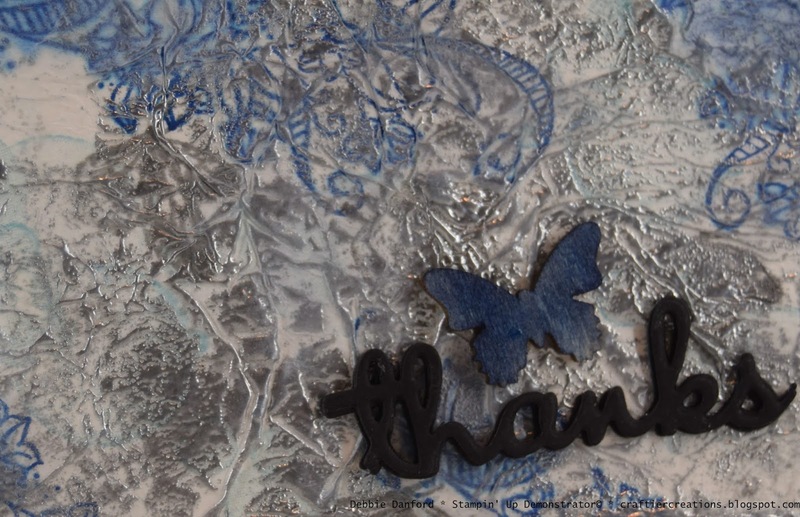 I used Balmy Blue, Blueberry Bushel and Smokey Slate, and embossed with Versamark and Silver Embossing Powder. 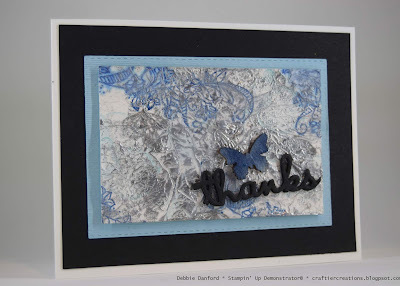 I know it's hard to see everything I stamped because some of it disappeared when I embossed. I used random stamps from the Beauty Abounds stamp set. I die cut the Thanks out of the center of the Basic Black layer 3 times to give it a little lift. 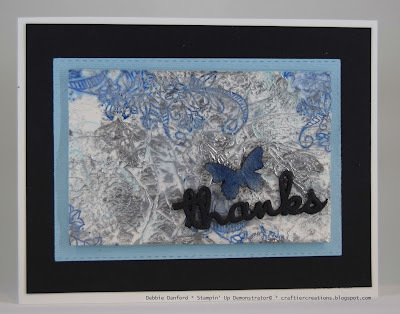 Colored the butterfly from the Butterfly Elements (free with a $50.00 purchase before S&T) with Blueberry Bushel. Die cut the Balmy Blue piece with the Rectangle Stitched Framelits, and attach all layers.